Remember Gideon? In the book of Judges, chapter six, we witness an angelic visit. Remarkably, the angel first announced who Gideon was in God’s sight, much to his surprise. In spite of the fact that Gideon was hiding down inside a winepress to sift wheat—this out of necessity, as the Midianites had destroyed their crops, and precious little food was available. Sifting wheat in a winepress may have been the prudent thing to do, but it certainly wasn’t the bravest. Yet God saw Gideon’s potential and spoke to it. And the Angel of the Lord appeared to him and said to him, The Lord is with you, you mighty man of [fearless] courage (Judges 6:12 ampc). The angel then gave Gideon his marching orders. Scary marching orders. And Gideon could hardly believe his ears. Gideon’s response? “But…how can I?” (verse 15). Gideon’s question was the very same question I have asked more than once. Isn’t that the very question that pounds against our hearts when we sense God speaking scary words of promise? Words that require effort and cooperation and faith on our part, especially when we don’t understand and when every cell in our bodies trembles with fear? Yet God saw something in Gideon. He saw his potential. And I’m convinced He sees the potential in us too. If only we will rise to the occasion. We may not defeat the Midianites, but God still desires to accomplish specific, awesome things both in us and through us. Things for which He has uniquely equipped us. Things that may not always appear grand or flashy, yet if He is the Author and Establisher of those things, we can be assured they hold eternal value. Everything God accomplishes in and through us matters. It all holds value and divine purpose. Even the nonglamorous things. The day-to-day things. The things we do that nobody ever sees. But God sees. And when we do each thing unto Him, He is not only honored, but greatly pleased. God uses who He wants…He doesn’t look for the talented so much as the willing. In both Gideon He saw a willing heart. Not a perfect heart, but a humble and willing heart. And with those two qualities, God can do anything. Those two ingredients allow God to fill in every blank. God chose us, equipped us with specific gifts, and desires for us to produce fruit. Eternal fruit. Jesus has literally appointed us to produce lasting fruit using the gifts God has entrusted to us. He is interested in results that remain—results that matter in light of eternity. In addition, we are expected to use well what we are given, or it will be taken from us. To those who use well what they are given, even more will be given, and they will have an abundance. But from those who do nothing, even what little they have will be taken away (Matthew 25:29). I want to be a faithful steward of what God has entrusted to me. I want to wisely use what I have been given, and I want to hear, “Well done, my good and faithful servant” (Matthew 25:23). How about as we ponder and pray, we ask God to enable us to recognize and accept the gifts He has given us? How about if we choose to accept the gifts—no matter how surprising—and commit to doing our part? What if, instead of agreeing with the enemy that there’s just no way, we link arms with Jesus, Who is the Way? 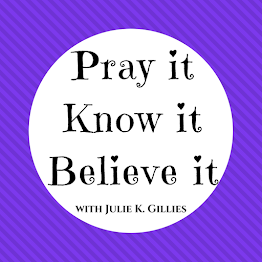 What if we determine to believe God is not only able to reveal our destinies, but to equip us in whatever way He sees fit and in His perfect timing? What if we step forward trusting Him instead of doubting ourselves? Let’s lay our humble and willing hearts before Him—those two beautiful ingredients with which Almighty God can supersede all we could ever dare to hope, ask, or imagine. Let’s acknowledge that we are women in possession of divinely bestowed gifts and talents, with specific assignments. And let’s dare to believe that we are, in fact, determined women of destiny. 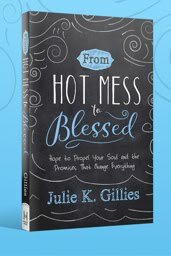 This is an adapted excerpt from my new book, From Hot Mess to Blessed. For more encouragement on your God-given destiny, and to receive hope that will enable you to embrace God’s promises for you, get your copy HERE or HERE. Reading this via email? 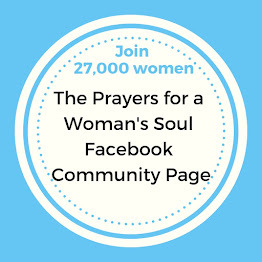 CLICK HERE to visit my blog and leave a comment. I so need this book in my life right Noe. My life has been a hot mess for quite some time, and I'm not sure where to start to get on track. 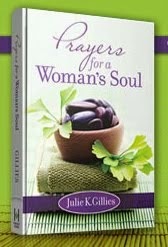 I believe reading your book will give me the head start l need. My email address is pg04181960@gmail.com. l have followed you for some time, and you're a blessing to many! It is Tuesday again. Three weeks ago on Tuesday morning I list my 42 year old daughter to a brain aneurysm. This book would be such a help.I am standing on all I know God to be, but my mother's heart is broken and crying out in pain. My email is jhedg55@gmail.com Thank you for your prayers. Julie, so thankful your home was spared from Irma - and thankful for your gift of teaching us how to pray, to trust in prayer and to love our Jesus more everyday. This is exactly what just happened to us. Bam. God gave my husband a job that he desperately needed but too far away from home for us to stay put. So out of the blue with no savings and a house that is no where near ready to put on the market to sell God completely spun us around and pointed us in the opposite direction away from our home. Absolutely a hot mess right now. So desperate for more of God's words and comfort to cling to as we know this is His plan.